Our beautiful Fountain on the Square of LaGrange is frequently visited and enjoyed by many. It has long been the site of numerous community events, evening walks, and even marriage proposals. The cascading pure water imparts a composed aesthetic to our downtown environment. It also provides a lovely back drop for numerous family photos and the like. The striking figure of Lafayette himself is often noticed in those pictures. However, how often do we as citizens of Lagrange stop to think about this very distinguished luminary in our American history? Moreover, how much do we know about Lafayette? Thanks to the celebrated work of distinguished scholar Alan Hoffman; an up close and personal account of this historical figure has been translated to English. The book was originally published in French in 1829 by General Lafayette’s private secretary who kept a concise journal as he traveled with Lafayette throughout the twenty-four states of America. 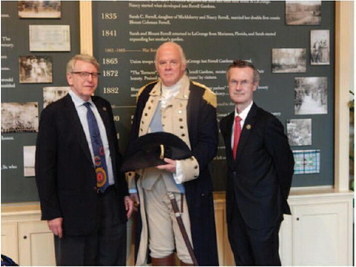 A great deal of our education about Lafayette has been focused on his military importance during his time in America. However, in his talk, Alan Hoffman asserted that the influence of Lafayette’s work as an abolitionist of slavery is profound. Hoffman maintained that much more should be known about this part of Lafayette’s story. He was a wealthy French nobleman who advocated for human rights and dignity for all; and he fully committed himself to end slavery. During Lafayette’s farewell tour in America, he was well-known by African-Americans for his efforts in the emancipation.